Even if you chose "large images", you still found many images that weren't appropriate for a resolution like 1600 x 1200. Now Google offers a new option: "extra large images" that only includes images for which the product between the width and the height is bigger than a certain number. Google didn't reveal the inferior limit, but it could be around 2,000,000 pixels, so you'll find images that have sizes like: 6016 x 416, 1024 x 2202, 1100 x 3700. This new option is useful if you're trying to find high-resolution images, but it's still not very good if you're looking for wallpapers that have a certain size in pixels. So how to find a sunset wallpaper for your computer? * add "wallpaper" to your query. This helps to filter some "noise", but it could also eliminate good results. Example: [sunset wallpaper]. * add "[width] [height]" or "[width] x [height]" to your query. This works because many wallpapers include information about size in the filenames or in a caption. Example: [sunset wallpaper 1600 1200] or [sunset wallpaper "1600 x 1200"]. * restrict the search to JPG images by adding "filetype:jpg" to your query. 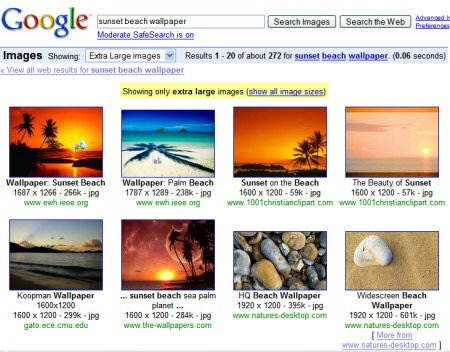 You could also try Yahoo Image Search that has a special restriction for wallpaper-sized images, Live Search that lets you find images that have the same size as your screen's resolution or Exalead, the search engine with the most advanced options, including a way to define restrictions for width and height. Flickr also has a group for wallpapers that includes more than 20,000 images: don't forget to sort the images by interestingness. And if everything else fails, using a Google Search or a custom search engine for wallpapers could be the best way to find a wallpaper. Hell yeah, Cody sure does rock! On Flickr, when viewing a group's photo pool, how do sort the pool by interestingness? There are three sorting options at the top of the page. This is the much Better way. Type the resolution of the Image Eg. 1400 x 900 and click Search. Optionally you can also select Large Images. For Example: click on this link.